California’s kids receive more than 50 childhood vaccinations. However, not all parents agree with the aggressive vaccination schedule and opt out. Well, they used to be able to opt out. Parental choice over vaccines was removed thanks to a state law passed in 2012. AB 2109 by then-Assemblyman Richard Pan, D-Sacramento, orders that children will not be allowed to attend public school without proof that parents have been counseled, and children vaccinated. The only exception to the law is a religious exemption. The State of California has injected itself into the doctor-parent relationship, and lawmakers can’t see how creepy this is. In the 1960’s, children received only four vaccines: Smallpox, measles, polio and mumps vaccines. Now, children could receive as many as 24 shots by 2 years of age and five shots in a single visit, according to the Children’s Hospital of Philadelphia. Most children receive 49 vaccinations by the age of six, and more than five dozen vaccinations from day of birth to age 18. The unspeakable issue at the root of Pan’s 2012 bill was and still is the influx of children from other countries into California’s public schools, who bring with them new strains of measles, mumps, chicken pox and flu bugs, among other communicable diseases. Children who have recently traveled out of the country also bring home infectious diseases. But it’s not politically correct to address that problem. Instead the Legislature wants everyone else to get vaccinated. “Outbreaks are possible if people have been traveling…. It’s about the other children at school. 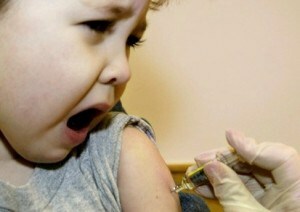 They depend on the rest of us to get vaccinated,” Pan said at an October 2012 hearing. But that was as far as Dr. Pan went, despite the elephant in the room. AB 2109 requires parents of public school children to either get their children vaccinated, or acquire a waiver from a doctor or nurse saying they have been counseled about the benefits and risks of immunization. But acquiring this waiver is not as easy as it sounds. Many parents testified at the 2012 legislative hearings that they had been “fired” by their pediatricians for daring to question the vaccinations. The Centers for Disease Control admits that as many as 30,000 adverse reactions to vaccinations are reported every year. And between 3,000 and 4,500 severe vaccine reactions, up to and including death, occur every year in the United States. Some doctors say that the numbers of severe reactions to vaccinations are much higher than the CDC’s numbers. State Senators Richard Pan, D-Sacramento, and Ben Allen, D-Santa Monica recently authored Senate Bill 277 to repeal the religious exemption that currently allows parents to opt their child out of vaccines in our schools. The legislative game played by lawmakers is to amend a bill until they can get it passed through the committee process. That’s what Pan did to get AB 2109 to the governor’s desk for signing. But that’s rarely where it ends. They usually come back the following year with another bill to restore the issues removed from the original controversial bill. But SB 277 is also being met with stiff opposition by parents. Thousands of educated parents have protested and held rallies at the Capitol, and made their frustration known. They know children not all biologically identical, and say the current one-size-fits-all approach to vaccination does not take into account differences among children’s genetic profiles or immune responses based on factors such as age, weight, and overall health status. Last week, Pan and Allen pulled a fast one and amended SB 277 by striking out a portion of the bill that would require school districts to send communications to parents notifying them of the percentage of students vaccinated in their school district. Their motive was to bypass the Appropriations Committee, which analyzes how much a bill will potentially cost the State and taxpayers. What this means is Senators Pan and Allen are fast-tracking the controversial bill. But this is not the first monkeying around Pan and Allen have done with SB 277; Pres. Pro Tem, Kevin de Leon, reconfigured the Senate Education Committee to stack deck in favor of passing SB277. During the Senate Education Committee hearing on Wednesday April 11 the bill was voted down 5-2. Committee Chairwoman Sen. Carol Liu, D-La Canada Flintridge, granted Pan an extra week to address questions about the bill, and to add in the committee’s requested amendments. However, within 24 hours, Minority Leader Sen. Bob Huff, (the Vice Chairman of the Education committee), who had been very vocal about his concerns with the bill, was replaced by Sen. Sharon Runner, R-Lancaster. Sen. Bill Monning, D-Carmel, a known “yes” vote, was also added to the committee. During the following Education Committee hearing on April 18th, the bill was held for “vote only” with no testimony, and was passed 7-2. During the hearing Sen. Runner said that it was difficult to vote on the bill without having been present for the previous weeks’ testimony. Senators Vidak and Mendoza, who were not present for the full hearing on the 11th, also appeared for the “vote only” session. Despite previous hearings in which hundreds of mothers of small children testified in opposition to the bill, Education Committee members who had been vocal about their concerns in the first hearing had little or no comment and voted “yes” in the second hearing. – In cases where the family selectively opts out of certain vaccinations, such as the Hep B vaccine at birth (a sexually transmitted disease that poses no risk to most children); chicken pox, etc. This bill removes parental rights while eliminating informed consent. California legislators are working towards taking away even more parental choice regarding vaccinations for their children. During Pan’s previous vaccine bill, an attorney testified that she represents parents over privacy and HIPPA rights. The HIPAA Privacy Rule provides federal protections for personal health information held by doctor’s offices, and gives patients an array of rights with how that information is used. Covering all bases, Congresswoman Frederica S. Wilson, FL-24, recently introduced the Federal “Vaccinate All Children Act of 2015.” This bill will require students attending public schools to receive vaccinations, with a medical exception for students who cannot be vaccinated. On Thursday May 14, SB 277 will be heard and voted on by the entire State Senate. This entry was posted on Tuesday, May 12th, 2015 at 9:42 pm and is filed under Blog Posts.